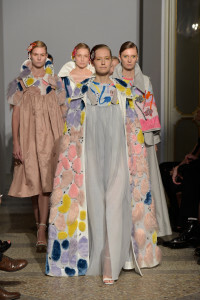 Violante Toscani’s graduate collection, Women I Wanna Be, has been inspired by a photo of her grandmother, Nonna Gina, in a classy gown in Paris in 1975, and by the heart shape of the young designer’s own puckered lips in selfies and videos, translated into fashion. 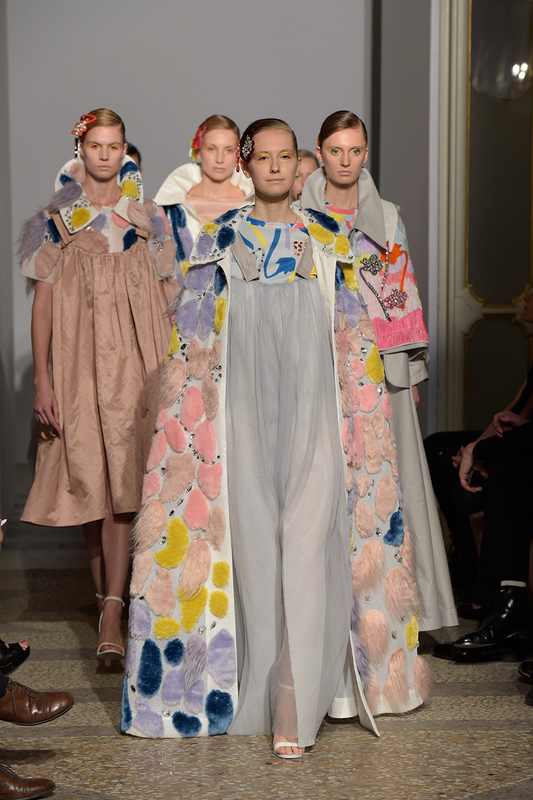 Violante is a graduate from famous school Polimoda in Florence. The collection’s mood is a revival of the glamour of classy, modern and smart women from those years: Violante’s color palette is based on pastels straight from 70’s: pink, light blues, yellow and white. They’re also used as spots of color on a white canvas on her outerwear. Something is clearly inspired by Lanvin’s style. And an extra touch of glamour is added by Swarovski crystals. The tops are tighter than the skirts that look very loose, like the women wore back in the Seventies. We love her design outerwear and her long, loose, dreamy gowns. Everything speaks about glamour, beauty and elegance. Women I Wanna Be has been presented along with other gifted graduates’ collections at Polimoda Show 2015 in June. Violante’s models wore natural and classy make-up and minimal hair together with her retro inspired clothes. Violante Toscani, 22 years old from Florence, has also won I-Skool Denim Awards for the category Active Jeanswear in July. At I-Skool,she has confirmed herself “best graduate designer” and she has challenged her creativity with a different mood than Women I Wanna Be’s retro glamour: her denim outfits were easy, casual and suitable for everyday life.